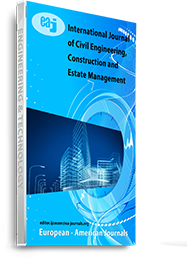 International Journal of Civil Engineering, Construction and Estate Management (IJCECEM) is an international, double-blind peer-reviewed journal published by the European Centre for Research Training and Development, United Kingdom. The scope of the journal includes surveying, environmental engineering, hydrology, soil mechanics, shear moments and forces etc. The Journal welcomes the submission of manuscripts that meet the general criteria of significance and scientific excellence. Papers will be published shortly after acceptance. All articles published in in IJCECEM are peer-reviewed. Papers submitted to this journal must be original, and are not considered in any other journals. The journal is published in both print and online versions. The online version of the journal is free access and downloads.